Eileen Davis, president of the Osage County Historical Society, shows the original deed to the city of Lyndon, which was found in files donated to the society. LYNDON—Several wooden boxes stored in Arlo Bell’s barn since the early 1970s have turned out to be treasure chests for the Osage County Historical Society. In the boxes, which contained files collected by Lyndon attorney A.K. Stavely during the 1920s to 1930s, was one document that confirms the history of Lyndon. 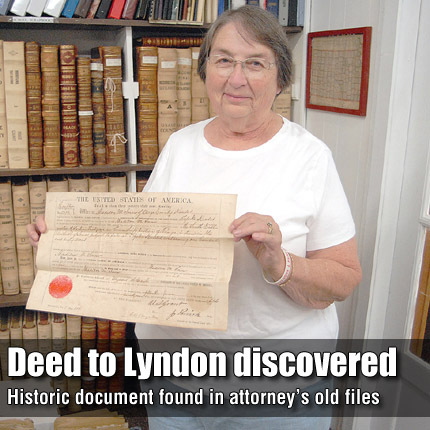 As historical society volunteers worked to restore and record the files, a deed that established the city of Lyndon in 1871 was found. The document, though yellowed with age, clearly shows a signature of Ulysses S. Grant, then president of the United States. Eileen Davis, president of the historical society, who found the deed, said the find came as a surprise after about 570 documents out of an estimated 1,100 documents in the collection had been reviewed. Davis said she was going through some of the files, most of which are letters pertaining to Stavely’s law practice, when she found stuck between file folders a folded piece of paper. “I could see the imprint of a seal on the outside,” Davis said. She said the existence of a seal indicated to her it could be an important find, as it turned out to be. Though folded in fourths, the paper was in good condition and Davis’ surprise came as she unfolded it and saw what it was.